Alright, I should preface this article by saying I have a serious soft spot for square-body Suburbans. They balance my desire for an old-school feel with dirt cheap maintenance and a wide availability of parts, but they’re also completely underutilized, making each build fairly unique. Something I always appreciate. This particular one, however, has to be one of my favorites. 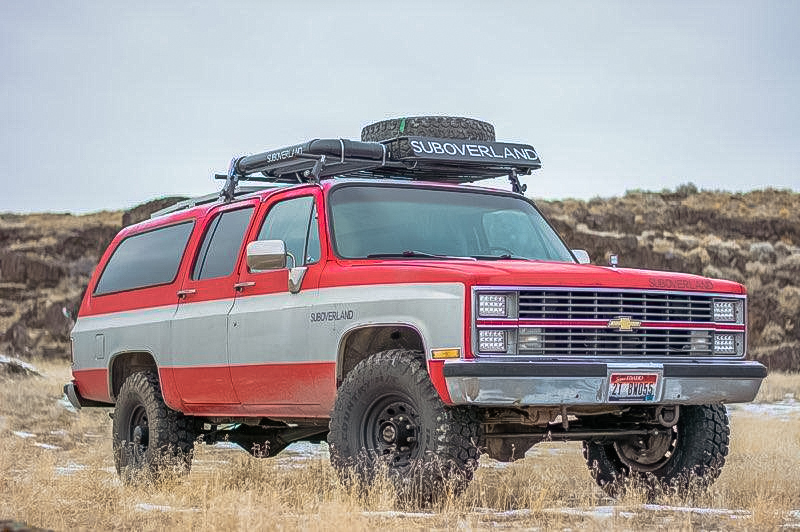 It’s built by Suboverland, a company that has started converting Suburbans for overland travel, and it’s rocking a simple retro look with steel wheels and a red and gray paint job. Inside, it has seating for five, and a full camper interior including organized storage, a fridge, water system, and a 6.2L diesel. Best of all, it’s just $11,000 USD, so lets take a look at this amazing build before it’s gone. First things first, this truck is not in “show room” condition. 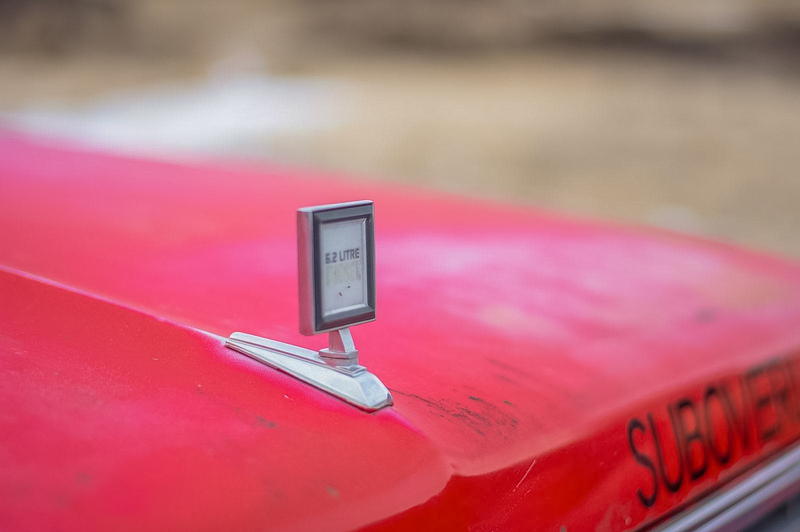 The seats have been swapped, the paint is clearly fading, and in general, it is showing the amount of patina you’d expect for a 1983 suburban, but the owner says it still runs smoothly with 124,500 miles on the clock. 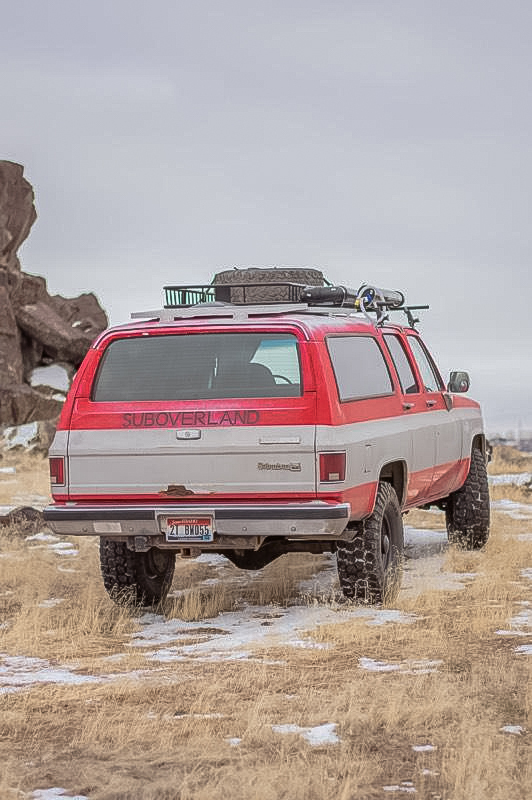 If that’s the case, this Suburban would be an ideal adventure-mobile, combining an attractive but unassuming exterior with all the comforts you’d want in an overland vehicle. Like a 6.2L diesel engine for example, which is described as “in amazing shape” by the seller.”It starts in cold weather no problem and doesn’t leak or burn oil.” That motor is turning a 3-speed automatic transmission, with a limited slip rear differential running 3.73 gearing. 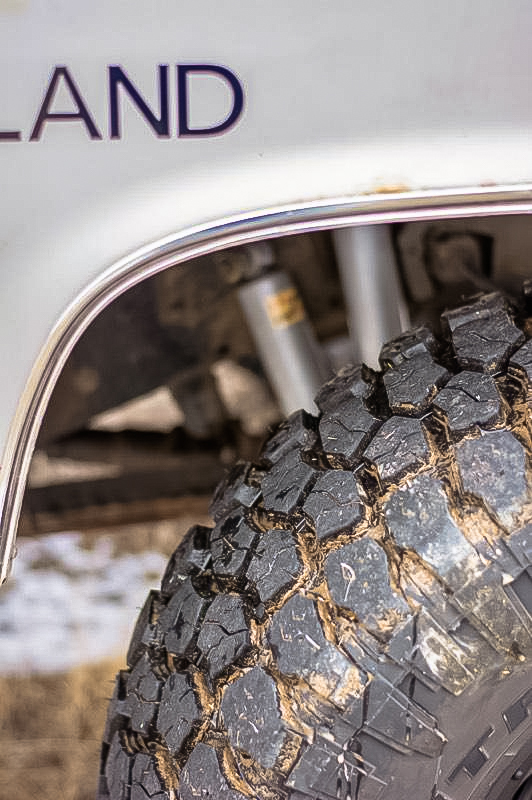 The four-wheel drive, of course, is ready to go and includes Warn locking hubs for additional reliability. The body is very straight with no sign of any wrecks, but it does have a couple of rust areas that could be repaired. The back tailgate is the worst spot along with the typical rear wheel wells. 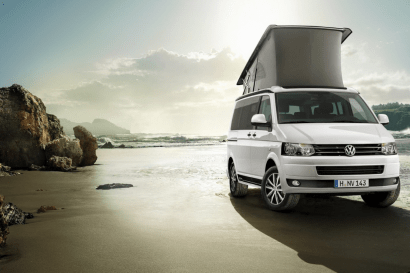 Upgrades on the exterior include two 100-watt solar panels and a 40-amp charge controller to regulate the power. This feeds two 100-amp-hour AGM auxiliary batteries, leaving the main battery for cranking up the truck’s enormous motor. 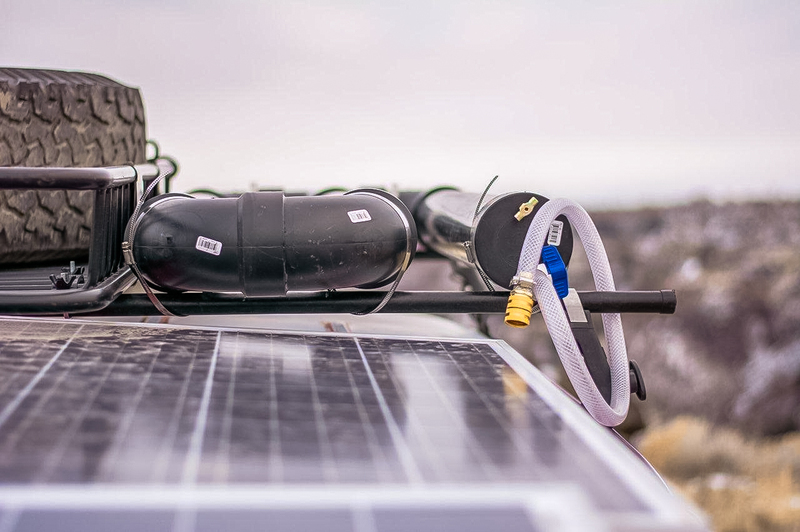 A roof rack has been added, with an 8-gallon solar shower and a full-size spare. The front end was rebuilt with brand-new upper and lower ball joints, inner and outer tie rods, a new drag link, and new steering stabilizer. KYB shocks replaced the tired stock units, and 10 ply 315/75R16 tires were stuffed underneath for additional traction and an aggressive look. Helping to turn these beasts are a brand-new power steering pump, lines, and power steering box. A dual-exhaust system and mufflers were added at the same time, and the rather underwhelming stock headlights were replaced with LEDs. 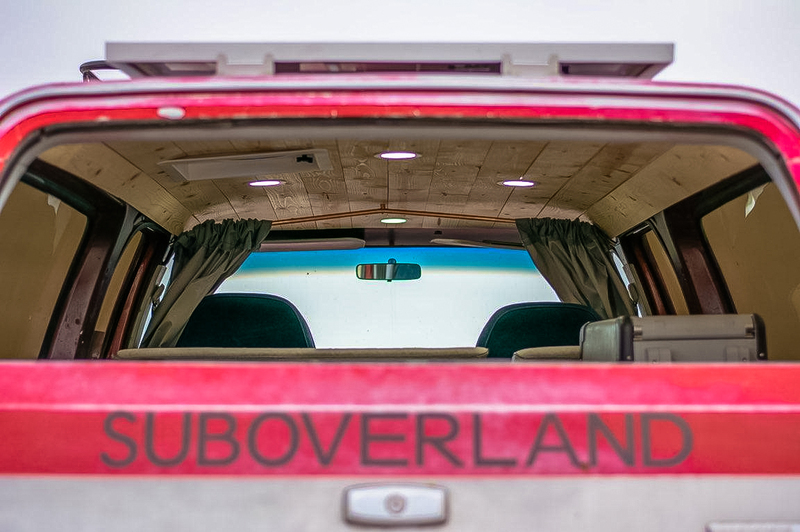 Things really get interesting on the inside of this 80’s Burb though. For starters, the steel shell has been fully insulated, and a gorgeous pine ceiling was installed to give it a distinct surf or mountain vibe. 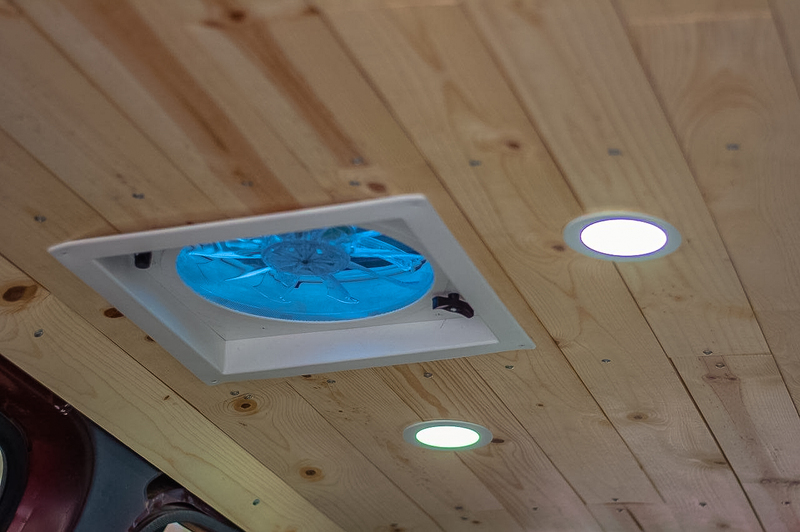 This is lined with flush LED recessed lighting and a fantastic fan for controlling temperatures at night and reducing condensation. 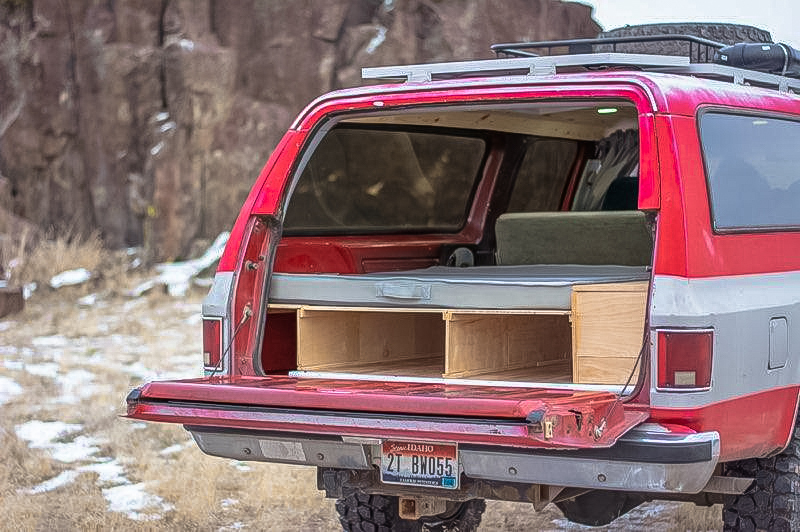 Insulated window inserts were created along with the interior curtains, making stealth camping a breeze regardless of where you find yourself. 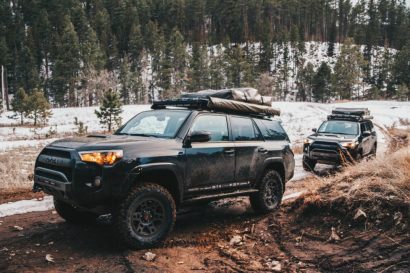 Not that you’ll be slumming it on a back seat or anything while stealth camping, as this truck features a platform bed with a full-size mattress inside. Beneath it, there’s plenty of room for bags and gear, or maybe a kitchen kit to go along with the Dometic CFX28 refrigerator/freezer bolted nearby. There are 12-volt plugs serve your charging needs in the rear, along with a 1,000-watt inverter for computers and other larger electronics. 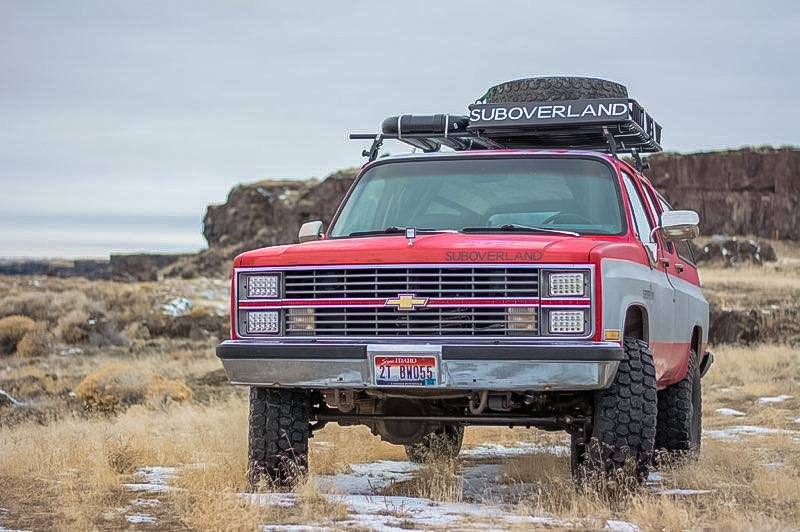 Although this truck might not fit the standard overland profile, it certainly packs all of the goods we like to see, at a price we can’t ignore. 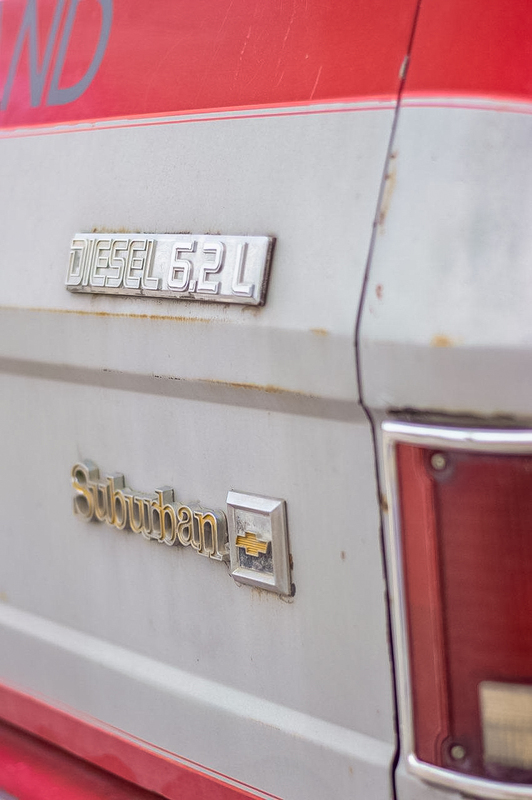 For anyone looking for a travel truck on the cheap, this Suburban could be a real steal. To learn more, reach out to Grady of Suboverland at suboverlander@gmail.com. 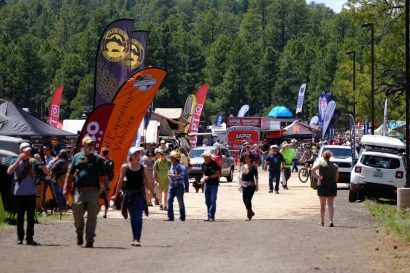 50 years ago, I had a $350 truck and camped on the ground and I survived. Today I camp with nearly all the modern convinces of a home. I’m glad to know now what I didn’t know then. 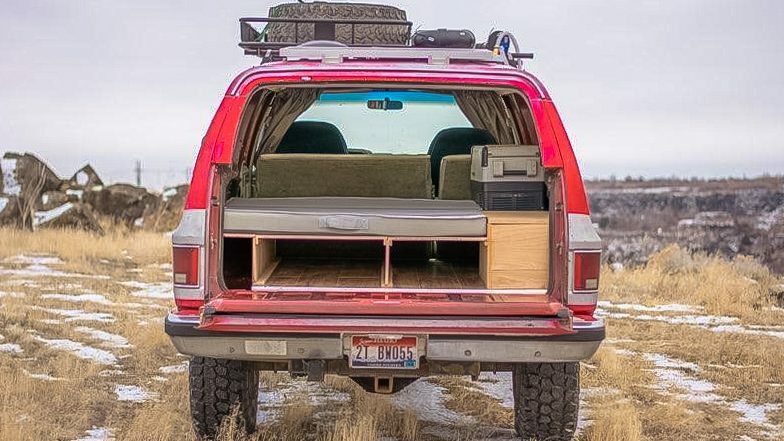 I love this and would love to read an article where you guys take this out on a weekend trip! 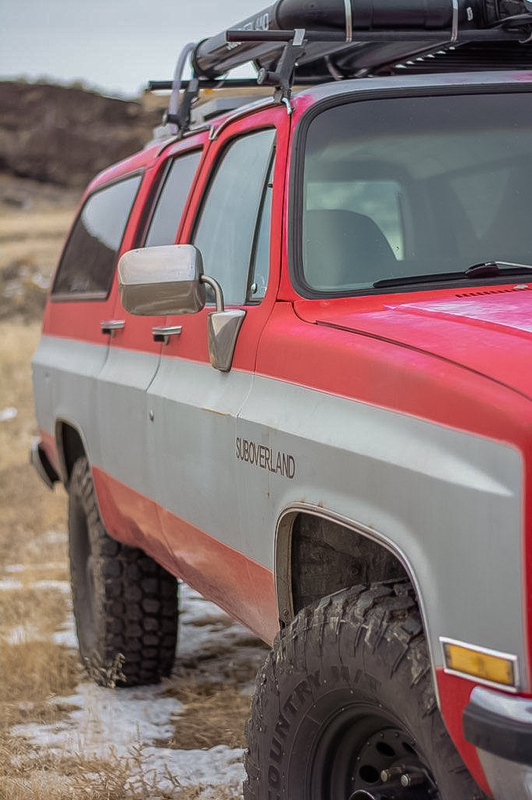 This is such a perfect case of how Overland vehicles don’t have to be $60k luxury vehicles. Now, I really want one of these, and to think it costs less than half of the value of my daily driver! Wonder what the performance chip did for it in terms of fuel mileage Highway driving at 60MH would be in a 6 liter diesel?